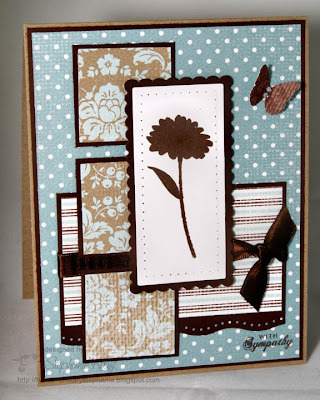 I was in need of a sympathy card this week, so I pulled out some soothing patterned paper and used Jen's Sketch For You To Try (from 4/4/09) to design the layout of my card. As I look at my photo above, I wish I had matted the 3 squares with either Kraft or chocolate cardstock instead of the white, but it's all stuck down now. This is the type of card that I never seem to have in my stash as it is one that I hope I never need. 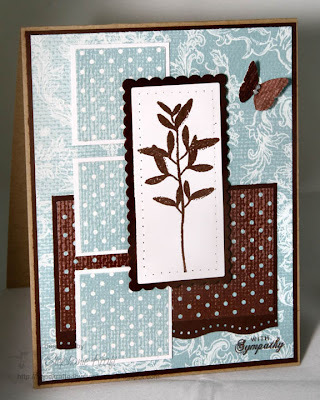 After finishing up my card, I realized that I actually needed 2 sympathy cards, so I used the scraps from the first card (love double-sided patterned paper!) and made another. This time, I matted my squares with chocolate cardstock, added ribbon and stamped a different image from the same Life set. I hope your week is going well. Thanks for stopping by! Accessories: Long Rectangle Nestabilities (Spellbinders), Cuttlebug (Provo Craft), dotted wave border punch (EK Success), butterfly punch (Martha Stewart), square punch (EK Success), paper piercer, rhinestones, foam tape.